Prime 1 Studio is proud to present 1:3 scale MMED2-01: Ash Williams statue from Evil Dead 2: Dead by Dawn. Ashley Joanna Williams also known as Ash is the anti-hero protagonist of the Evil Dead series. played by Bruce Campbell. and created by director Sam Raimi. Ash is one of the few non-monster characters in the "Horror" genre to have such notoriety and most easily recognized based on his final iconic appearance armed with a sawed-off double barrel shotgun and a chainsaw strapped to the stump on his right arm where his hand once was. Capturing the likeness and details of Bruce Campbell. this Museum Masterline 1:3 scale statue of Ash Williams comes with an additional alternate portrait stepping on a trap door with Henrietta trying to escape from the cabin cellar floor. 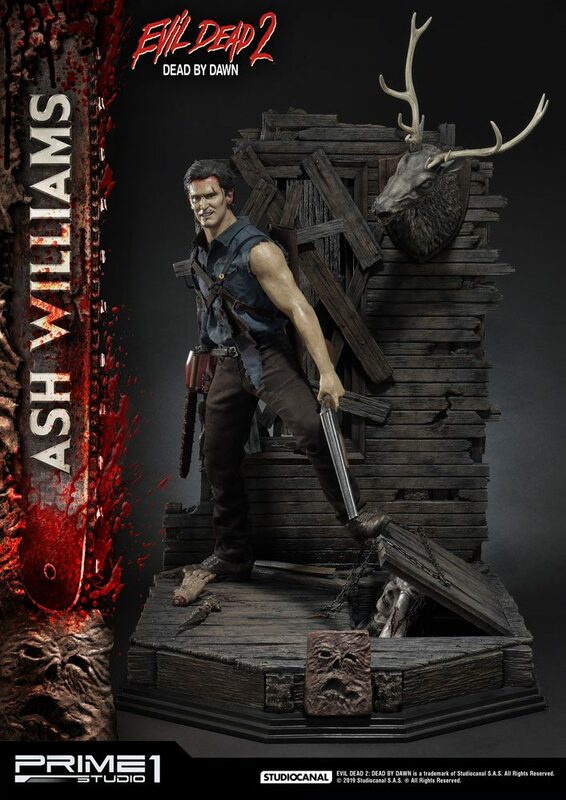 Evil Dead fans don't miss your chance to own Ash with his infamous chainsaw and his sawed-off double barrel shotgun!